The Kwik Fit British Touring Car Championship is the UK's most illustrious championship and is followed all over the world. The racing is fast, close and full of action. Since its inception in 1958 it has attracted and captivated millions of fans around the world. All cars are built to the same NGTC regulations allowing independent teams to compete on a level playing field against manufacturer-backed teams. Also in attendance are the F4 British Championship, Ginetta GT5 & Junior Championship and the National Mini Se7en and Mini Miglia Challenge. All tickets for this Race Meeting are listed below. Children between 13-15 years old will need to hold a teen ticket for this race meeting. Children 12 and under accompanied by an adult (max 5 children per responsible adult) are admitted to the circuit and paddock (providing the responsible adult is still accompanying them) free of charge. Children 5 and under will be permitted to sit on a parent/guardian lap and therefore admitted free of charge. Where pre-allocated seats are issued then all seats taken must be paid for, irrespective of age. Saturday 18 May - Paddock access is free. Admission tickets include access to the paddock. Sunday 19 May - An adult paddock ticket is required. Teen tickets include paddock access. Call our office on 01264 882200 (option 1) for all event information. Enjoy BTCC qualifying plus all the action from the supporting championships. Also includes a Paddock Pass. BTCC race day. Three rounds of the BTCC championship plus all the action from the supporting championships. BTCC race day ticket + paddock pass. Enjoy Three rounds of the BTCC championship plus all the action from the supporting championships. Attend both days of the BTCC race meeting. Includes paddock pass for both days. ONLY AVAILABLE IN ADVANCE. NOT AVAILABLE AT THE EVENT. 13-15 year olds will need a teen ticket. 13 - 15 year olds will need a teen ticket. Includes paddock access. Family BTCC race day ticket. This ticket is for 2 x Adults & 2 x Teens (13-15 years old). Includes paddock pass. Children 12 and under go free. Family BTCC weekend ticket. This ticket is for 2 x Adults & 2 x Teens (13-15 years old). Includes paddock pass for both days. Children 12 and under go free. Grandstand seat for Saturday May 18. Get the best view for all the BTCC and support race action. DOES NOT INCLUDE ENTRY TO THE CIRCUIT. Grandstand seat for Sunday May 19. Get the best view for all the BTCC and support race action. Enjoy BTCC Qualifying day (Saturday 18 May) from the exclusivity of the new Thruxton Centre. The upper floor and balcony is reserved for VIP packages and is limited to a small number of places. The VIP package includes admission in to the Circuit, access to the Paddock, free Race Meeting programme, morning reception, pre-lunch drinks, lunch and afternoon tea and complimentary bar. Age restrictions apply. Enjoy BTCC Race Day from the exclusivity of the new Thruxton Centre. The upper floor and balcony is reserved for VIP packages and is limited to a small number of places. The VIP package includes admission in to the Circuit, access to the Paddock, free Race Meeting programme, morning reception, pre-lunch drinks, lunch and afternoon tea and complimentary bar. Age restrictions apply. Camp on site for the BTCC race meeting. £6 per night, per person. Payable on arrival. No charge for Sunday night. 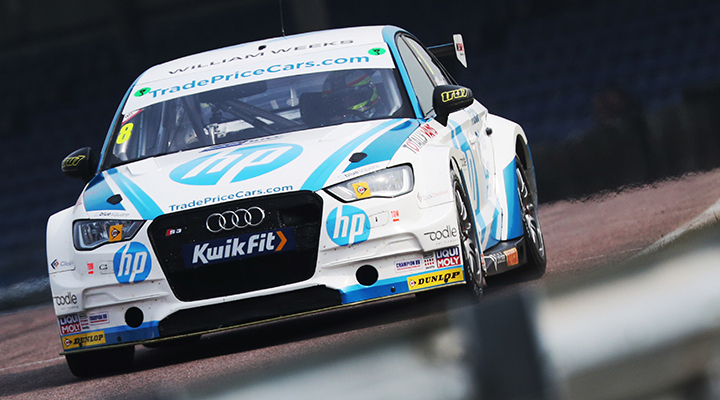 BTCC qualifying day, plus all the action from the supporting championships. Attend both days of the BTCC race meeting at Thruxton. Includes paddock pass for both days. Minimum order of ten tickets. Enjoy BTCC qualifying day from the exclusivity of the new Thruxton Hospitality Centre. The upper floor is reserved for VIP packages and is limited to a small number of places. The VIP package includes admission in to the Circuit, access to the Paddock, free Race Meeting programme, morning reception, pre-lunch drinks, lunch and afternoon tea and complimentary bar. Age restrictions apply. It's back! 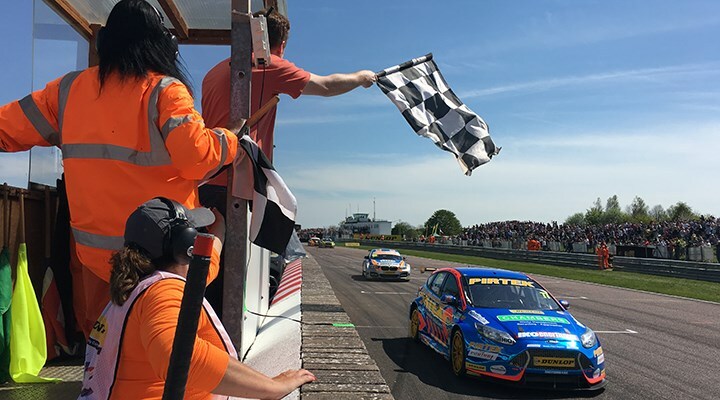 Our competition to wave the chequered flag for the first British Touring Car race at Thruxton will run again this year. As we have two BTCC race meetings this year, a winner will be picked for each race meeting. On race-days, a radio commentary is provided by 'Radio Thruxton' available on 87.7FM. Earpiece radios are available to purchase on site. Located in the centre of the circuit, close to the paddock areas. This facility is open on all motorsport event days and some evenings. We have ten individual suites available for hire on race days. The suites are located adjacent to the start/finish straight, opposite the race control tower. There are six double suites and four single suites. Each double suite provides seating for 20 guests or standing for 40 guests. Each single suite provides seating for 10 guest or standing for 20 guests. Additionally garden furniture is available for use on the paved and grassed areas in front of the suites. Thruxton Suite - Located in the centre of the circuit, close to the Thruxton Centre. The Thruxton Suite is ideal for board meetings or private dining etc. and has its own private bar. Our corporate clients travel from all over the world to experience world-class racing and we are pleased to offer catering facilities that complement the pleasure and excitement of our on-track activities. We can cater for up to one hundred and thirty people. Located beneath the air traffic control tower, on the outside of the track. Historically, this building housed the command and control offices when Thruxton was occupied by the Royal Air Force. The Jackaroo is now open seven days a week between 9am and 5pm. Camping is operated on a first come first served basis, we currently only charge for camping for the BTCC and the BSB race meetings at £6.00 per adult per night. Children 15 and under are free. If you choose to stay the night of the race day and leave the following morning you are able to do so free of charge. 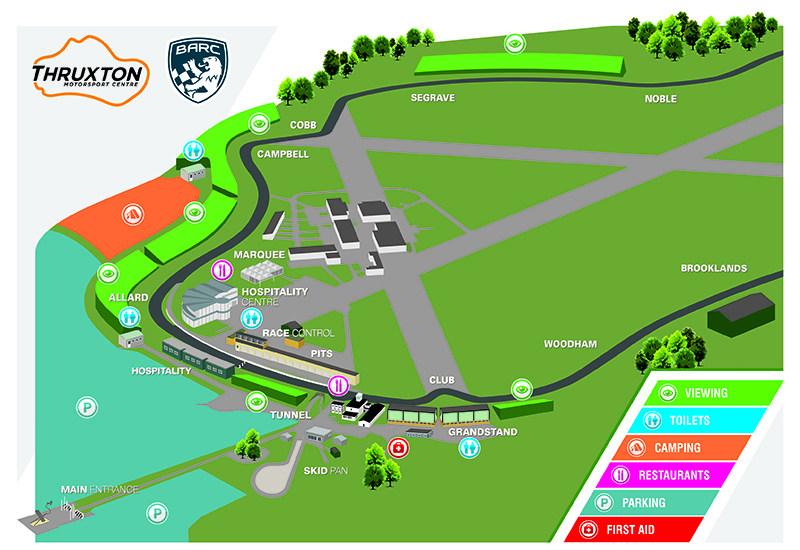 The campsite is open and manned from 12pm (Midday) the Friday before the BTCC meeting and it's open and manned from 12pm (Midday) on the Thursday before the BSB meeting. The campsite is manned 24 hours but the latest arrival is 11pm, to avoid disruption to the other campers. All tickets are posted first class unless you have requested special delivery. If you have ordered your tickets and you are concerned that you have not received them please call the ticket office on 01264 882200 option 1, and we will try to help trace your order. All tickets are sent well in advance of the race meeting to ensure you receive them in time. If your tickets have not been delivered, please contact us as soon as you can. In the rare event that your tickets have not arrived in time you will need to purchase them at the gate, we will then refund you after the event. All you need to do is return the on the day ticket and your original advance tickets to the ticket office. Unfortunately advance tickets cannot be collected on the day of the event due to the multiple number of entrances into venue. BTCC, BSB & Race Meetings - Grandstand seating is not included in the price of the admission ticket. Grandstand seats can be purchased separately in advance and on the day of the event - subject to availability. British Trucks & Thruxton Motorsport Celebration Race Meetings - Grandstand seating is free on the Saturday only. Sunday, seats must be paid for. CSCC Race Meeting - Grandstand access is included in the price of the admission ticket. Camping is operated on a first come first served basis, we currently only charge for camping for the BTCC and the BSB race meetings at £6.00 per adult per night. Children 15 and under are free. If you choose to stay the night of the race day and leave the following morning you are able to do so free of charge. Children aged 15 and under are admitted free of charge to the Circuit and Paddock (max 5 children per responsible adult). Except for the BTCC and BSB Race Meetings where children aged 12 and under are admitted free of charge to the Circuit and Paddock. A teen ticket is available for 13 - 15 year olds. If you are a Member of the BARC you are able to purchase discounted tickets on production of your membership card. If you are purchasing more than 10 tickets for the same event, we offer a corporate rate. Please contact our office on 01264 882200 (option 1). The circuit is open from 8am. BTCC & BSB Race Meetings - Children 13-15 years old must hold a teen ticket. Children 12 and under accompanied by an adult (max 5 children per responsible adult) are admitted to the circuit and paddock (providing the responsible adult is still accompanying them) free of charge. All other race meetings, Children 15 and under accompanied by an adult (max 5 children per responsible adult) are admitted to the circuit and paddock (providing the responsible adult is still accompanying them) free of charge. We have a designated banking area for Blue Badge holders, which is accessible via Gate 4. This is a raised bank for you to park your car, providing a view over the 'Complex' section of the circuit. There is also disabled parking at the top of car park A. Ask a member of the security staff to direct you if you're unsure. All passengers/driver must have relevant admission tickets. If you have lost any of your property please report it as soon as you can to the BARC office which is located under the Members grandstand (01264 882200 option 6), this is where any lost property is handed in. In the event that a child is found to be lost within the circuit, they will be taken to the BARC Office where CRB checked staff will care for them until they are reunited with their parent/guardian. We have St Johns Ambulance on site in various locations and we also have a manned medical centre in the paddock, any member of staff or security will be able to assist you. Thruxton is an active airfield and race circuit and as such there is a strict no dogs/pets policy on site, except for blind/assistance dogs who are allowed providing they are kept on a lead at all times and are easily identifiable as blind/assistance dogs. Any dogs/pets found to be locked in a vehicle will be removed. There are baby changing facilities in the paddock toilets, the Goodwood Restaurant, the toilets at Allard and Chicane corners.